Living by the coast has some serious perks. When your friend Jacey asks you to come sail, you say yes. We headed out for a sunset cruise with friends. When it comes to being out on the water, there always tends to a chilly breeze in the air. So I went for a lightweight button down and jeans to keep me warm. Subtle stripes for a little nautical touch. Also, I got my hair braided! 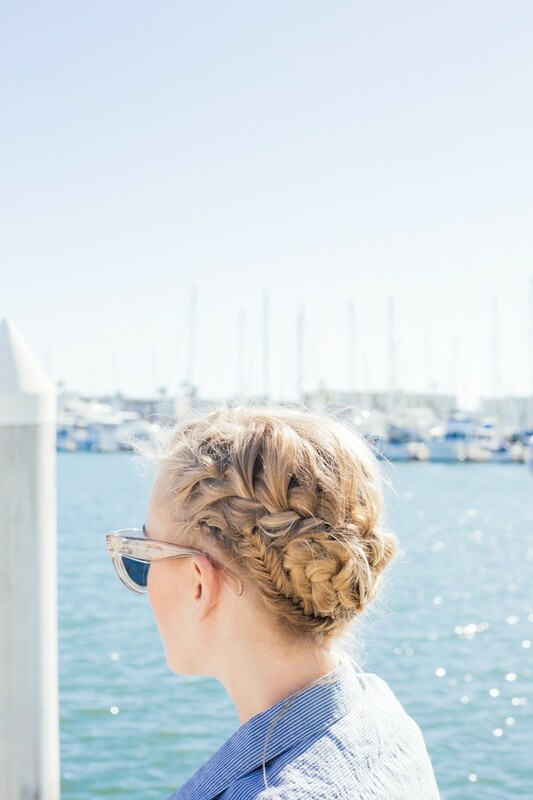 HOW COOL ARE THESE BRAIDS?! All in all, pretty incredible way to spend our night. Love a little West Coast adventure. Bella B - Beautiful hair! Perfect for out on a windy boat. Natali - Looking beautiful and so fresh! Great photos and a cruise like outfit! Taylor - Lights Camera Catwalk - You look absolutely STUNNING. Seriously. vera - You look AMAZING! These photos are incredible! Jessica - Seriously, can you gift the universe and give us instructions on how that braided up do masterpiece was constructed? Please and thank you. Kriti - I love your hair! Inatrendytown - I love the soft colors of the outfit and your hairstyle is absolutely fantastic! Amanda - Such a good top – and I LOVE those shades! Khanh Hoang - Whoa! What a nice outfit! I love the whole fashion stuffs you’re wearing, especially the shirt. You girl look beautiful, comfortable and relaxed. Sanja - This look is amazing! Your hair is gorgeous too!